TD4 level at Gran Dolina site/CENIEH. 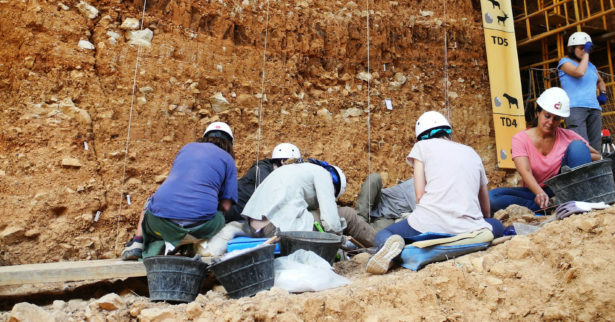 Geochronologists from the Centro Nacional de Investigación sobre la Evolución Humana (CENIEH) have led a study published in the journal Quaternary Geochronology about the chronology of the archaeological site of Gran Dolina, situated in the Sierra de Atapuerca (Burgos), whose results confirm a pulse of human dispersion in southern Europe around one million years ago. Samples from the levels TD4 to TD6 were analyzed using paleomagnetism, a methodology which is increasingly used for establishing absolute datings given its great versatility and the fact that it has an extremely wide chronological register, because the magnetic field remains captured in sediments when they are formed. These days there is a known register covering a timeline of over 180 million years up to the present, so that as Álvarez affirms, “it’s a very powerful tool for chronology”. The second paper, which has just been published in the journal Quaternary Science Reviews, focuses on the chronology of the lower sedimentary fillings, and corroborates the datings found for TD4.